Ready for an eye-opener? 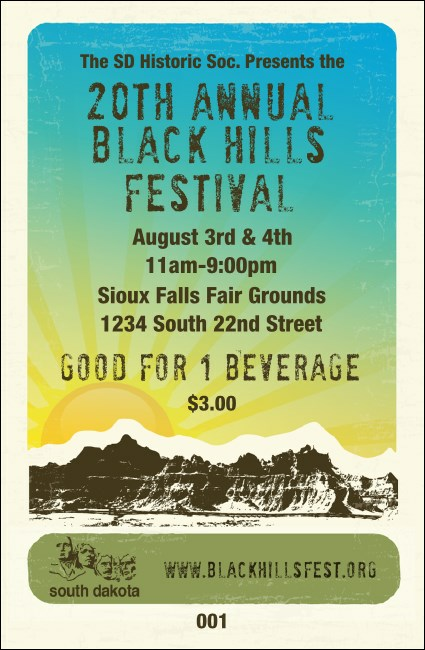 Look to the sunshine with this South Dakota Drink Ticket, celebrating the beauty of the Mount Rushmore State while keeping your guests hydrated and your event secure and orderly. Drink Tickets let you sell drinks in advance and at the door, or, reward your favorite people with free drinks! Looking for something else? You'll find a finite variety of designs at TicketPrinting.com.